The suggestion that the domestic dog originated in East Asia has been challenged. The huge genetic diversity of dogs found in East Asia had led many scientists to conclude that domestication began there. But new research published in the journal PNAS shows the DNA of dogs in African villages is just as varied. An international group of researchers analysed blood samples from dogs in Egypt, Uganda and Namibia. Today's dogs are descended from Eurasian grey wolves, domesticated between 15,000 and 40,000 years ago. The authors say the process by which humans domesticated the dog is poorly understood. Lead scientist, Dr Adam Boyko of the Department of Biological Statistics and Computational Biology at Cornell University, says he decided to look at village dogs because they are so much more genetically diverse than bred dogs that they may hold the key to the origins of dog domestication. The team analysed DNA from 318 dogs from villages in Egypt, Uganda and Namibia and measured their genetic diversity. They also analysed the genetic make up of dog breeds thought to be of African origin, for example the Saluki, the Rhodesian Ridgeback, and the Pharaoh Hound and compared all the resulting data with results for non African dogs such as Puerto Rican street dogs and non-pedigree dogs in the US. 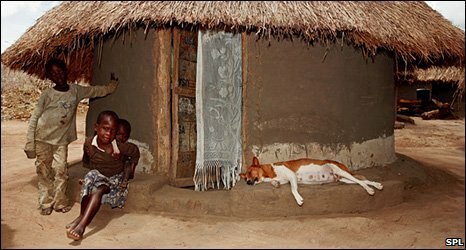 The emphasis on African village dogs came about because Adam Boyko's co-authors, his brother and sister-in-law, were travelling in Africa on honeymoon. They collected all the blood samples from the African dogs. The team found genetic diversity among African village dogs is just as diverse as that of East Asian dogs, leading them to question the hypothesis of an East Asian origin for dog domestication. Dr Boyko told BBC News: "I think it means that the conclusion that was drawn before might have been premature. It's a consequence of having a lot of street dogs from East Asia that were sampled, compared to elsewhere. "The reason that East Asia looked more diverse than elsewhere was not because East Asia as a continent had more diverse dogs than elsewhere but because non breed street and village dogs are more diverse than breed dogs." He said he was not ruling out East Asia as a possible location for the origin of the domestic dog - but it could equally have been anywhere else on the Eurasian landmass where there were both grey wolves and humans. Co-author Paul Jones of The Waltham Centre for Pet Nutrition, UK, said: "It's interesting to know the answer to the question of where dogs were first domesticated and this paper goes some way to giving us an answer." Dr Boyko said that all the dogs sampled in the study have grey wolf DNA so he is not questioning the hypothesis that dogs descended from Eurasian wolves. The results led the team to conclude that today's African village dogs are a mosaic of indigenous dogs descended from early migrants to Africa. They also went some way to proving the origins of some pedigree dogs purported to be of African origin. For example the Saluki breed shares DNA with modern day village dogs from Egypt - as does the Afghan Hound, despite its name. Likewise, the Basenji breed is genetically very similar to some Namibian and Ugandan village dogs. However the Pharaoh Hound and Rhodesian Ridgeback have little in common with any African indigenous dogs which suggests that these two breeds have non African origins.